I had a good time at Box Whisky Festival 2015. One of the highlights turned out to be a Glenlossie. Up until this Glenlossie I had only tasted three. And those three gave me a very mixed experience. 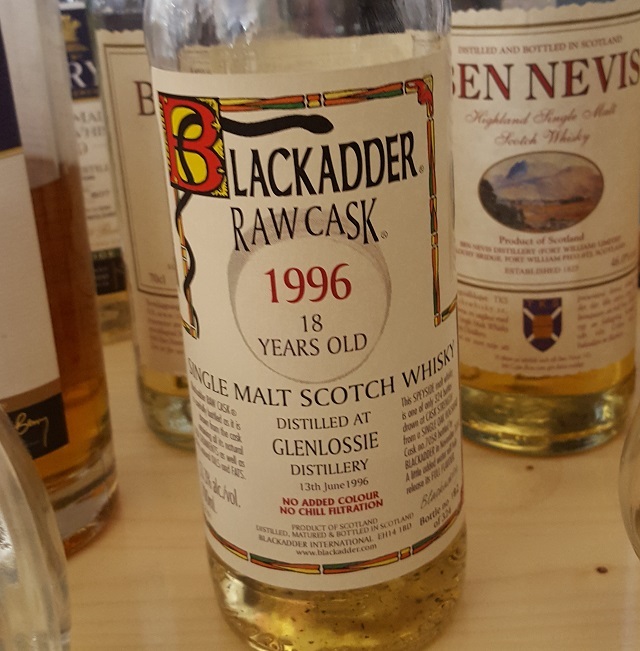 Todays Glenlossie is released by the independent bottler Blackadder. It was distilled 13 June 1996 and bottled November 2014. It was matured in hogshead #7058. The outcome was 324 bottles. The whisky is available in Sweden at SEK 1229 (item number 85075). It is not available in Norway. Nose (22/25): A bit oaky and dusty at first. Then came citrus and vanilla. And then: Cinnamon rolls - the raw ones! Sugar and cinnamon and butter mixed with dough. After a while I found the smell of Champagne as well, the yeasty kind. Taste (23/25): Smooth and rich! Quite complex too. Vanilla, salt and cinnamon at first. Then pears and a lot of different spices. Finish (22/25): A long finish with dried papaya and pineapple. A lot of different spices in the end. Quite dry. Some caramel added some more sweetness beside the fruits. Balance (23/25): I love it. A very rich and complex whisky.